Okay, wow, not too posty, huh? We’ve come to that point in the year when all that stuff starts coming together to make me crazy. My last book came out in September, and queries about a release date for the next one are on the rise. Which is awesome and nice, but always makes me edgy. Put that together with the realization there are less than two months left of school and then I won’t have a quiet day for who knows how long, and I start to freak out. 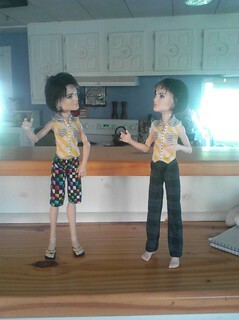 Besides that, I have a sewing project I said I would do for doll club. It has a deadline. Suffice it to say I am way behind. Nevertheless, Briar and I have been doing some dolly stuff and managed to make a nice pattern for shorts and pants for our Monster High boys. Briar did the pedal work at the machine for these shorts while I did the steering, and made it through the whole project without losing interest. Yay, Briar! I’m happy enough with the pattern, it’s just that it’s a long way from perfecting a pattern to getting it ready for anyone else to sew. All those step by step photos! But I would like to get that done and out in the foreseeable future because, unlike the girls, the Monster High boys are pretty straight and even, and easy to sew for. I also have some stuff I was working on for the Lati tinies that I’d like to finish. But of course, that’s me all over, isn’t it? Always something I’d LIKE to finish and not enough actually getting stuff done. In other news, I started a reference area of the site today and posted some doll measurements. Maybe someone will find those useful. This entry was posted in Project development and tagged doll, dolls, dolly delicacies, fashion dolls, measurements, monster high, sewing patterns. Bookmark the permalink.